DELFINGEN is an industrial adventure but it’s much more than that: it’s a human adventure. It started over 60 years ago and we’ve come a long way! DELFINGEN is constantly evolving to anticipate the market’s and our customers’ expectations. DELFINGEN: on the move, energetic, growing. No-one knows what the future holds and we can see that on a daily basis so, actually, uncertainty is our safest bet! And that is exactly why – beyond the quality of its products, the excellence of its industrial innovation and its capacity to innovate – DELFINGEN has always considered that its first investment is in the men and women that make up the company. These women and men are our first wealth because they understand our environment and constantly adapt to the changes, both individually and collectively, to meet the challenges that come up every day. Talents, Values, Bonds and Exchanges give meaning to our actions and play a key part in making DELFINGEN a sustainable company, a company that truly stands apart. How can we ensure that the women and men at DELFINGEN, with all their differences, can truly work together and aim at the same goal: the company’s sustainability? This is possible only because these men and women share the same values and apply them on a daily basis. 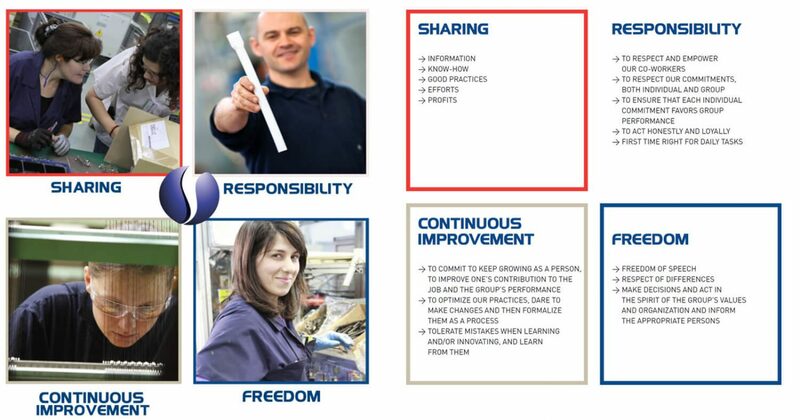 The values that unite us are Sharing, Responsibility, Continuous Improvement and Freedom. Because of the markets, the competition and our customers, we need to be highly demanding towards each and every one of us. We find our legitimacy in being so very demanding because of the deeply benevolent attitude we have towards all of our colleagues.